Once your genotyping project is complete, you will receive results. The results file will be in an Excel .csv (comma-separated text file) format. Once your genotyping project is complete, and data has been analysed, your project manager will e-mail you with the results. Typically, you will receive an e-mail with a link to your data file on our secure web server. The results file will be in an Excel .csv (comma-separated text file) format. You can open this type of file in Excel and work with the data in there, or import the file into our SNPviewer software to view the data graphically. In SNPviewer you will be able to see the clustering of your datapoints but will not be able to edit the genotyping calls. SNPviewer (free-of-charge) can be downloaded from our website. 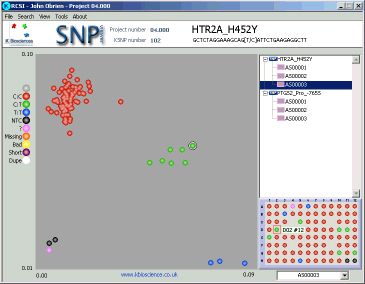 Example of genotyping data viewed with SNPviewer.